The Bourbon: Van Winkle Special Reserve 12 Yr. “Lot B.” The middle child of the Van Winkle bourbon family, this whiskey has a whiff of vanilla crème brûleé and a tasty hint of fine chocolate. 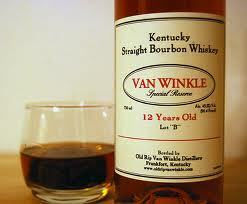 The company credits the bourbon’s exceptional taste to the brand’s time-tested grain formula and yeast strains. Van Winkle bourbons are wheated, meaning wheat replaces the usual 15% rye in the mash bill that gives bourbon its spicy bite. Sweet and fruity, aged wheaters can trick your tastebuds into believing they’re being bathed in cognac.